In the presence of green and wet, we become blind to deserts, in the same way sociopaths are blind to the existence and reality of other people. 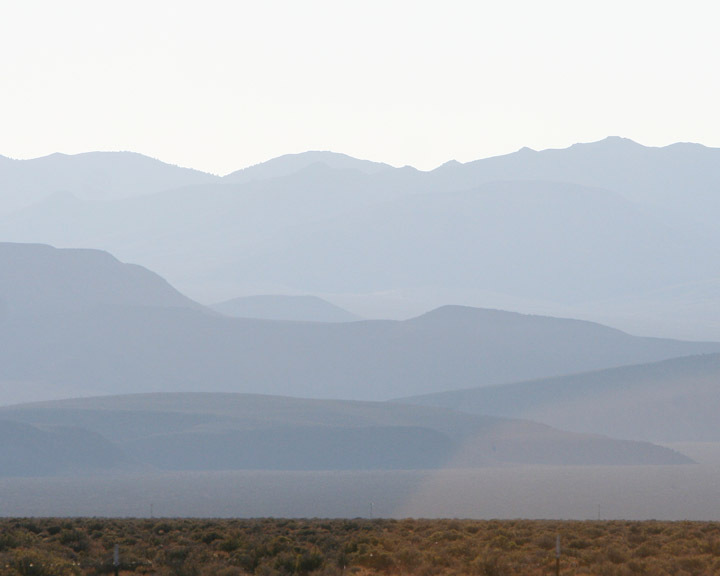 On the desert highways of Nevada, you’ll occasionally see an oasis off in the distance, a green, lush place — maybe a hay farm, or a little spring-fed resort — and you’ll think “Wow, that’s beautiful.” Your eye is drawn to green, and in that drawing, it looks away from the dryer stretches. Those vast “other” swaths are the not-green, the dry, dead, useless desert, easily envisioned — if you think about them at all — as pavable, gradable, dirt-bike-able, atomic-bomb-able. Sacrificeable, without pause for second thoughts. Scale that mindset down to the individual level and imagine someone who cared only about that which was of direct and immediate benefit to him personally. Imagine someone who thought everything else, everyone else, was nothing more than dirt — a collection of inconveniences whose trivial existence might be casually swept away to make room for something more useful. We’d call that person a sociopath, someone so sick mentally we wouldn’t feel safe around him. Tragically sick, because we know that outside the emotional blindness of the sociopath, there is an immeasurably valuable universe of fascinating, vital, real people. Just so, outside the green-blindness of human values and awareness, there is a rich, living domain of unique and astonishing splendor: The desert.